Playlists let you organize music in many ways. Rather than listening to an album, you can choose your favorite tracks by one artist, or set up a mix of dozens of artists, all with a few clicks. In this installment, I’ll address questions about gaps between songs, copying playlists on a USB stick, combining multiple playlists into one, and more. I use several playlists as background for meditation and find the short break between songs to be distracting. How can I have songs play sequentially without a break between them? The tiny gap between tracks in iTunes can be really frustrating. If all the tracks are part of the same album, you can use the Gapless Album option (select the tracks, choose Get Info, click the Options tag, and select Gapless Album). If you use the Crossfade Songs option, you can choose how much time each track overlaps. 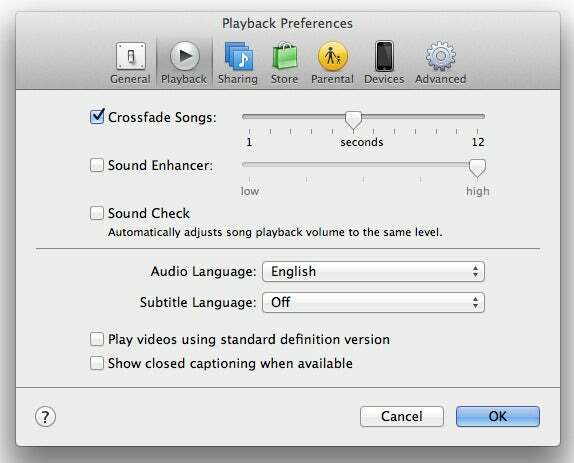 Otherwise, what you should try is turning on the Crossfade Songs option in iTunes’ Playback preferences. When you check this and choose a time in seconds, iTunes overlaps tracks, fading from one to the next. If you have specific songs with portions of silence in the tracks themselves, you can alter the start and stop times within iTunes’s Options tab, or use an external audio editor to alter the tracks permanently. I go into more detail in an article called “Trimming your music tracks”. I’d like to take a playlist from iTunes and copy it to a USB stick. Ideally I’d like to drag the playlist to the USB and have a folder created on the USB that contains all the songs in the playlist along with the artwork, lyrics, and so on. I know I can drag each song onto the USB but that just wasn’t what I had in mind. Can you help? There is a way to put both the music and the playlist on a USB stick, assuming that you want to import that playlist into iTunes on another computer. First, select all the songs in the playlist, then drag them to the USB stick. You can export and import playlists from the File -> Library submenu. Next, with the playlist selected in the source list, choose File -> Library -> Export Playlist. Save this file on the USB stick as well. To import this playlist to iTunes on another computer, first copy the music files into iTunes. 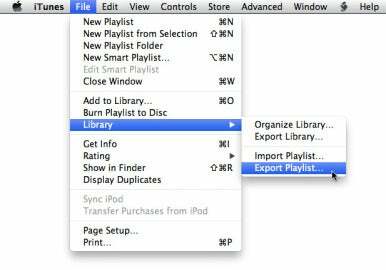 Next, choose File -> Library -> Import Playlist and select the playlist file you exported earlier. The playlist will display in the iTunes source list, with all the songs that you added. Is there any way to associate a single song file with multiple albums? I have sometimes five or six copies of the same the same song taking up space on my hard drive because they are ripped from different albums (originals, best ofs, soundtracks, and the like). There’s no way you can tag one song with multiple album tags. If you create playlists for each of your albums, you could add one version of a song to each playlist. The album name attached to the file would be the same each time, but it would appear in the playlist as though it were from the album for which you created the playlist. But keep in mind that the track number will be whatever it is for the master file, so your other albums might not play in the proper order. I have several ‘favorites’ playlists. Sometimes I’d really like to have iTunes play a bunch of those playlists together—playlists of playlists. Is this possible in iTunes, and if so how? I can think of two ways. The first is to drag the playlists you want to listen to onto the iTunes DJ icon in the source list; this will add their tracks to iTunes DJ (if you don’t see the icon, go to iTunes’s General preferences and check the box next to iTunes DJ). You can learn more about iTunes DJ in “Spinning songs with iTunes DJ”. Another way is to create a smart playlist (File -> New Smart Playlist) that contains those multiple playlists. Choosing Playlist from the first pop-up menu, Is from the second, then choose the name of one of your desired playlist from the third. Now, click on the plus (+) button to the right of that line, and do the same thing again, adding a different playlist. Repeat until you’ve added all the playlists you want. Before you click OK to save the smart playlist, make sure the top of the smart playlist reads Match Any Of The Following Rules (if it says Match All Of The Following Rules, your smart playlist will be blank.) Save the smart playlist, and it will contain all the songs of the selected playlists. I am an actor and listen to a lot of plays as audiobooks. Often the plays contain as many as 30 tracks or so, instead of just having a track for Act I and a track for Act II (or five tracks for a Shakespeare plays). I have them all in my books sections as audiobooks. Is there a way of combining them so that there are fewer tracks for each play? As a big fan of Shakespeare, I have recordings of all of his plays in my iTunes library. There are two ways to deal with your situation, and a Macworld article I wrote, “Ripping and playing audiobooks”, tells you about both of them. The easiest thing for you right now, given that you have the files already, is to create a smart playlist. In my sitution, I’d set it to Artist Is William Shakespeare, Album is The Tempest, and Plays is 0, for example. As each track is played, it gets removed from the playlist, since the play count increases to 1. This simple smart playlist will let you organize plays to listen easily with iTunes or on an iOS device. Make sure you change the files’ media kind to Music (select them, press Command-I, then click on the Options tab, and choose the Media Kind menu). This puts them in your music library so you can use this type of smart playlist. If you still want a small number of files, you can use Doug Adams’ aforementioned Join Together to join tracks you’ve already ripped. [Senior contributor Kirk McElhearn writes about more than just Macs on his blog Kirkville. Twitter: @mcelhearn Kirk is the author of Take Control of iTunes 10: The FAQ, second edition].